As 3pm approaches on any given weekday, I find myself craving a pick-me-up to pair with my afternoon caffeine kick. When I leave my apartment in the morning, this moment in the day is rarely on my mind; I’m just trying to get out the door and can’t be bothered to dig around for a snack. Plus it’s all too convenient to pop into the french bakery down the street for some light macarons, or grab a small box of chocolate covered almonds from the bodega on the corner. Just like it was way too easy to buy a pastry from the library cafe or a bag of M&Ms from the vending machine. So when I saw a recipe for a “snacking cake,” I knew I’d met my afternoon craving match. Here was a cake that I could bake on the weekend or after work to avoid my ever growing to-do list, then easily slice up and pack for an effortless snack. The idea of a snacking cake is so appealing to me, as a cross between quick bread and pound cake. 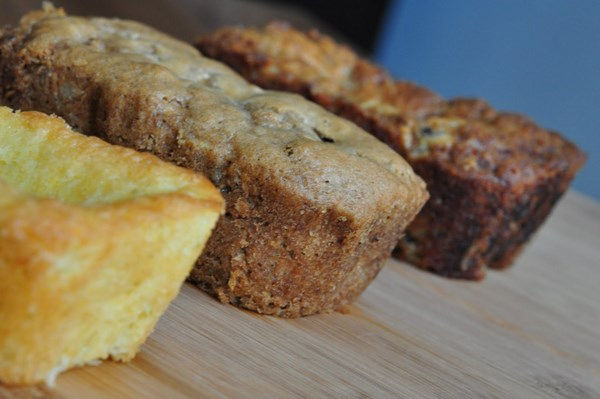 I stay away from baking pound cake (too dangerous to keep that around the house), but regularly satisfy my baking itch with various quick breads. In attempts to keep them far away from the cake category, I often try to cut the butter and sugar down, with mixed results. This Whole Wheat Apple Cinnamon Snacking Cake strikes a happy medium. It has its fair share of both butter and sugar (which I’m positive could be reduced for the more strictly health-conscious among us), but doesn’t come off too sweet. Browning the butter brings a rich nutty undertone to each slice, and the dollop of apple butter brings out the kick of cinnamon and apple flavors. Plus the whole-wheat flour adds some substance and color. A perfect treat all on its own, this snacking cake can be amped up with a schmear of nut butter or jam. Or dress it up for dessert, and serve it with fresh whipped cream or vanilla ice cream for a low-key but delicious end to a meal. The original recipe is just for cinnamon snacking cake, so a number of other fruits/flavors could be substituted instead of apple. But we all know apple-cinnamon is a classic combination. Preheat oven to 350°F and grease a 9×5-inch loaf pan. In a small saucepan, brown the butter. Follow Lucy’s instructions for browning butter here! You know it’s done when your kitchen smells rich and nutty. Make sure to keep an eye on it though, so it doesn’t burn. While the butter browns, prepare the rest of the ingredients. In a large bowl, whisk together the brown sugar, yogurt/milk, apple butter, vanilla, and cinnamon. Add the eggs one at a time, whisking well until they’re incorporated. In a smaller, separate bowl, whisk together the flours, baking powder, baking soda, and salt. Once the dry ingredients are well mixed, combine with egg mixture in larger bowl and whisk until smooth. With a spatula, fold the browned butter into the mixture in three additions. The batter will look very slick and greasy at first, but don’t worry! Keep folding! The batter will come together. Once the butter is well incorporated, mix in the apple. You want the apple to be evenly distributed, but be careful not to overmix! Pour the batter into the loaf pan and bake for 50-55 minutes, or until the cake is a deep golden brown and a tester comes out clean. Let the cake cool in the pan for about 5 minutes, then remove and place on a wire rack to cool thoroughly. Thanks for the recipe..leant wait to taste it!